This Fish-fry is done in hotels here in Chennai.U can even deep-fry Egg slices, chicken pieces,Cauliflower florets,Paneer pieces,Bhindhi, Capsicum,cabbage and bread slices using the masala for the marination. Mix all the ingredients for marination and marinate fish pieces in this paste for 15 mins at least. 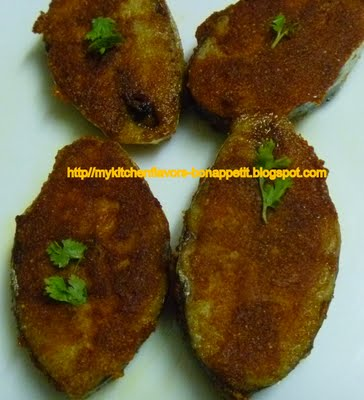 Heat oil in a kadai and deep-fry these fish pieces till they turn golden brown.This fish fry will have a thick coating of masala over it if done properly. U can have this alone with ketchup or with rice,bread slices,etc. what is bhajji bonda mix powder? please specify. WHAT IS BHAJJI BONDA MIX? what is bhajji bonda mix powder? Thank u so much khuserv and Golu.